I can't believe how fast this year went by. 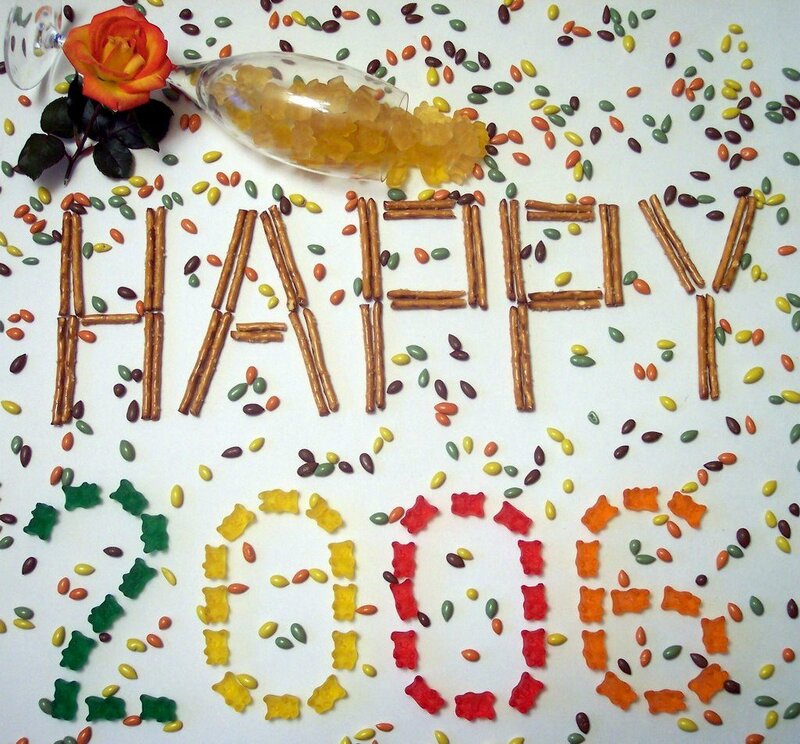 It is already the last night of 2005. I have had so much fun with this blog since starting earlier this year and I hope to continue this journey well into 2006. In total, we have added at least 170 of the new recipes that we tried since we started the blog and will continue to add each week. The to-try pile of new recipes seems to swell each week, but my goal will be to try to keep reducing it as we can. I also have quite a few new cookbooks that would like some attention too. Happy New Years! 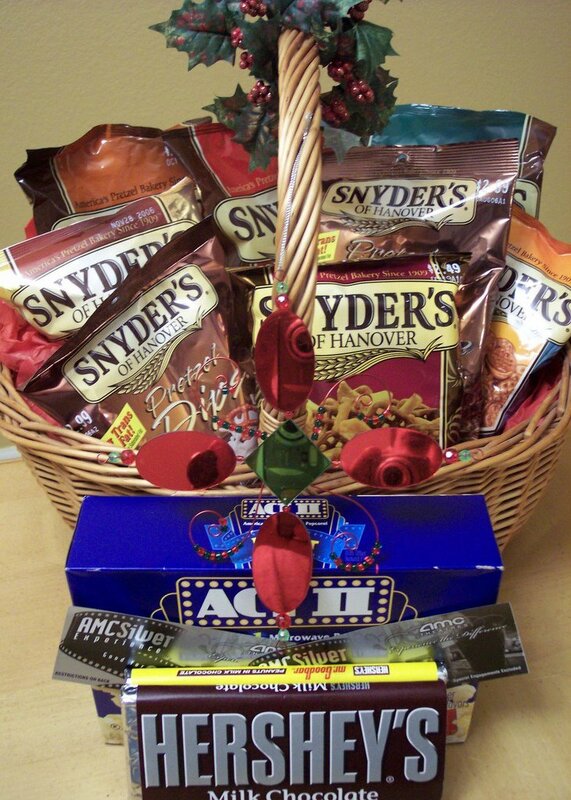 Have some Gummy Bears, pretzels and candy coated sunflower seeds on us! I am excited for this new year to come and see what different foods we try and what new things we can create. Looking back since we started the blog, we have tried so many things I never thought we would eat and enjoy (especially this and that) since we were both very picky eaters at one time. My hope is this continues as well! We will be staying in tonight with entertainment from Netflix as usual. So... I did not pick this one, Eddie Izzard: Dress to Kill, and I don't know what to expect. I only know this is in the comedy genre, so if this is a dud I'm sure we will be able to find something fun until the ball drops! If you are going out tonight, please take care and have a safe evening. 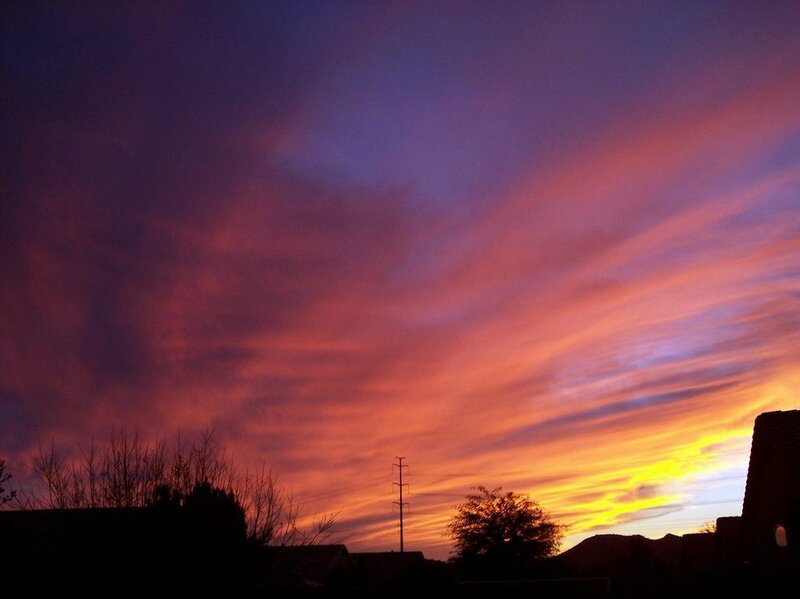 We will leave you with the final sunset here in Phoenix for 2005 with many more to come in the prosperous New Year. Oh peanut butter, how do I love thee? Well... today I love you with bananas! 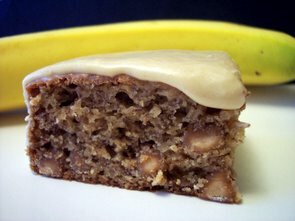 This snack cake, Frosted Peanut Butter Banana Bars, is a very moist and tender cake with chunks of peanut butter chips throughout. A rich layer of frosting, kicked up by peanut butter, helps bring both flavors together. 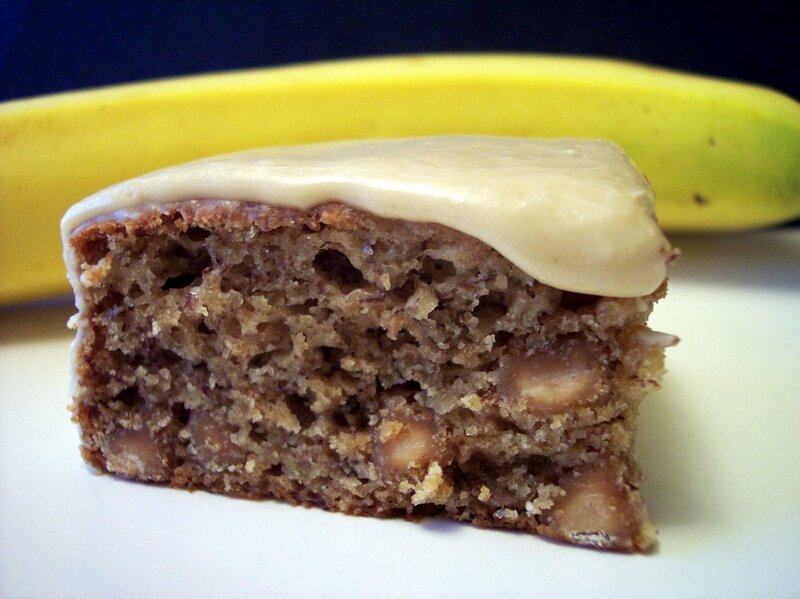 The banana flavor is more dominate than the peanut butter, but you can definitely taste both. 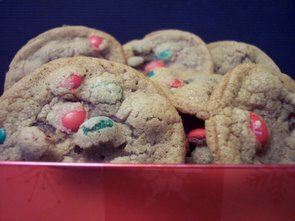 Throwing the peanut butter chips into the flour, before adding it to the wet ingredients, helps keep them suspended in the batter instead of sinking to the bottom. The recipe for the frosting makes a bit too much for 1 cake, in my opinion, as I could cover the sides as well as the top and still have some leftover. I'm sure you could find something to use up the extra with! 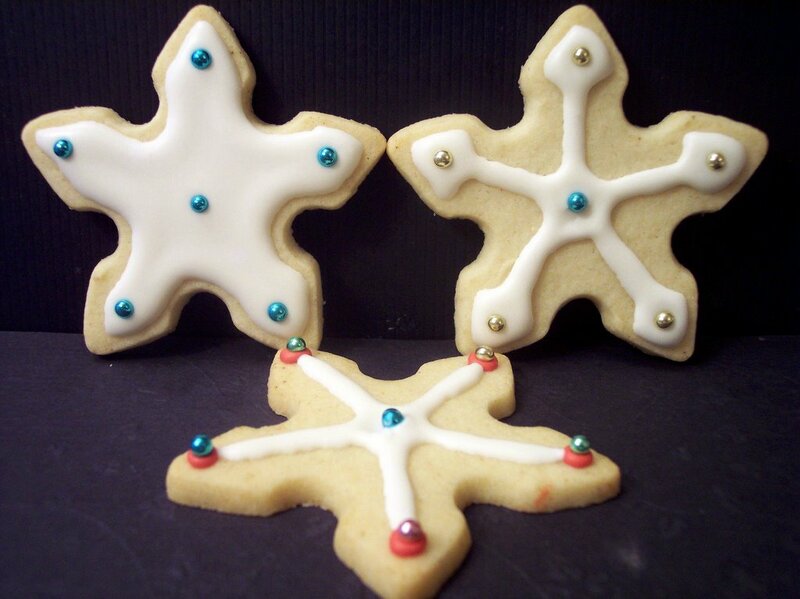 If I had some extra cookies or something I would use it there! If you need a speedy pasta dish for dinner, this one came together quite fast. 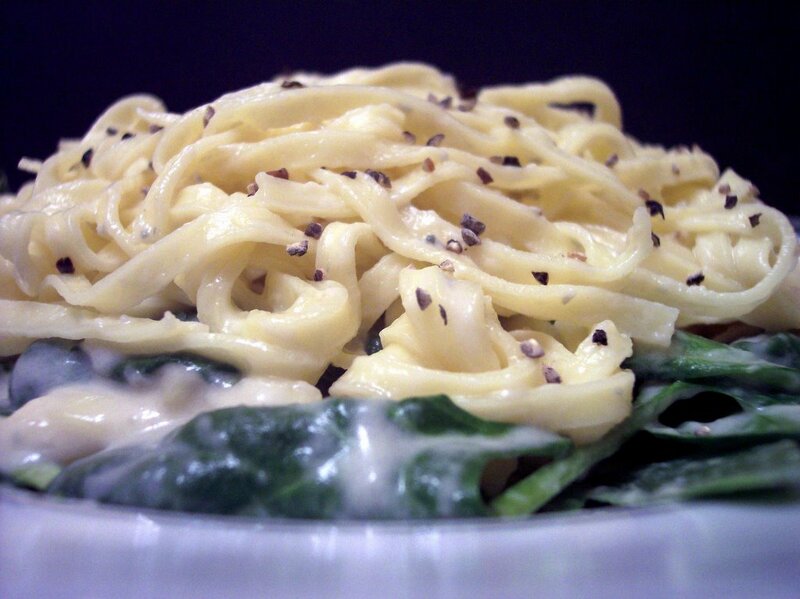 Linguine and Spinach with Gorgonzola Sauce uses fresh pasta which only takes a couple minutes to cook. The cheesy cream sauce should be started before you cook the pasta as it takes about 7-10 minutes to finish. The rich sauce is defined by the sharp blue cheese flavor and evaporated milk smooths it out into a creamy coating for the fresh pasta. Next time, I would coarsley chop the baby spinach as it did not wilt much and some of the pieces were quite large. Sliced grilled chicken would be an excellent addition if you did not want a veggie-only dish. Since we try so many new and different recipes, I am always on the look out for recipes that I would repeat and that would be guest worthy. I am leary of trying out new recipes on guests because I want to make sure it is something that works and then I can work out any kinks beforehand. The dish we had tonight is definitely something I would make again for guests. I would probably serve this either as a brunch item or dinner as it seems a little heavy to me for breakfast. 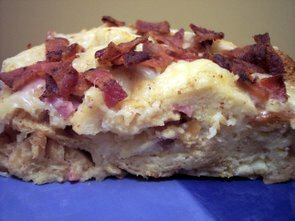 Bacon, Gruyère, and Ham Strata is filled with toasted sour breadcubes that keep their shape well and do not turn to mush. 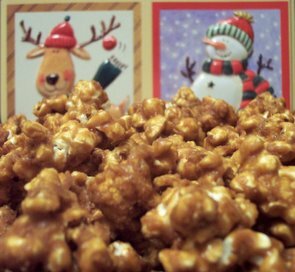 A generous amount of cheese gives the top coating a nutty flavor and crispy bacon lends a nice saltiness. To give the ham a little boost in flavor, I did brown it a bit before adding it to the mixture. I find this adds an extra depth of flavor it otherwise would not have. I am a big fan of blueberries. If you took a peak at inside our freezer, you would find it has at least 3 bags of wild organic blueberries from Trader Joes at all times. I usually have at least 1/2 to 1 cup a day with yogurt or in a smoothie. It is not often that I use them in savory dishes, but tonight was a wonderful execption. 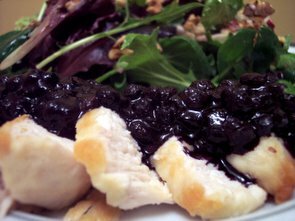 Turkey with Blueberry Pan Sauce starts off as a winner as it uses very little dishes. After searing a couple turkey tenderlions, they are baked in the oven in the same skillet just until no longer pink in the middle. 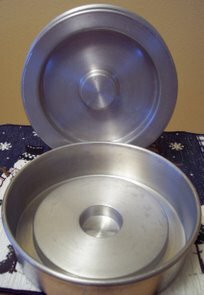 They are moved to a covered plate to keep warm while you prepare the sauce. The same pan is now used again so you can get all the flavor from the bits and pieces left behind from the turkey. 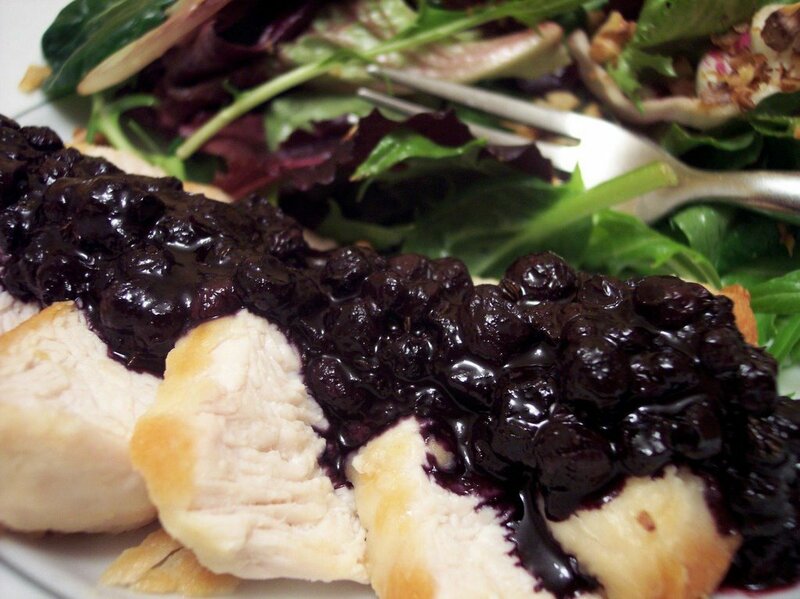 Blueberries are cooked down with balsamic vinegar until they release their exquisite juices and become thick. The vinegar cuts the sweetness so it does not overpower the tender turkey. This combination worked so well. To serve along side, I made a Mixed Salad with Vanilla-Pear Vinaigrette topped with Toasted Walnuts. The vinaigrette was quite a unique combination of flavors. I was a little disappointed that I could not dectect any vanilla, but even without it the taste was quite pleasant. I changed the recipe a bit by adding some extra-virgin olive oil and using a couple different vinegars. I used an immersion blender to combine and the dressing was very smooth. Slightly sweet from the pears and a bit of spice from cayenne had me going for another serving. I will have to find a use for the leftover vinaigrette as we both thought it made the salad. 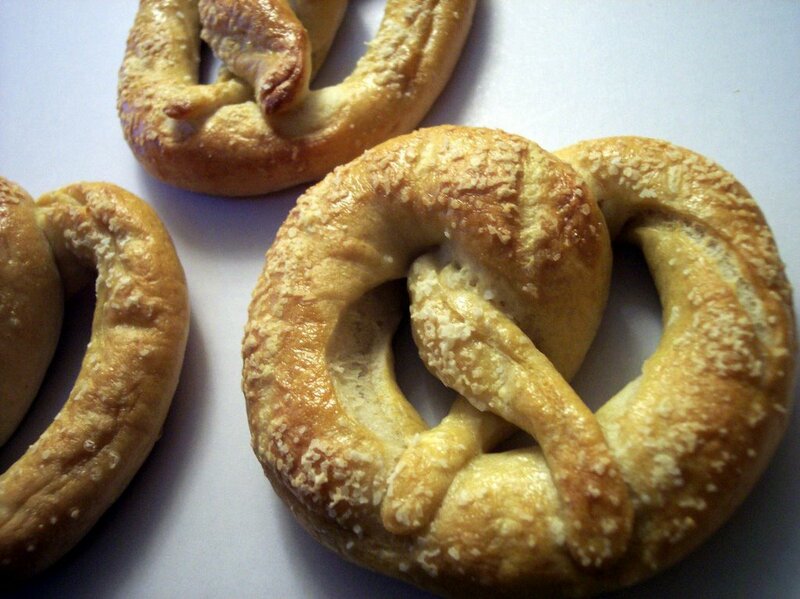 One of my favorite snacks to make is homemade pretzels. They freeze and reheat well. 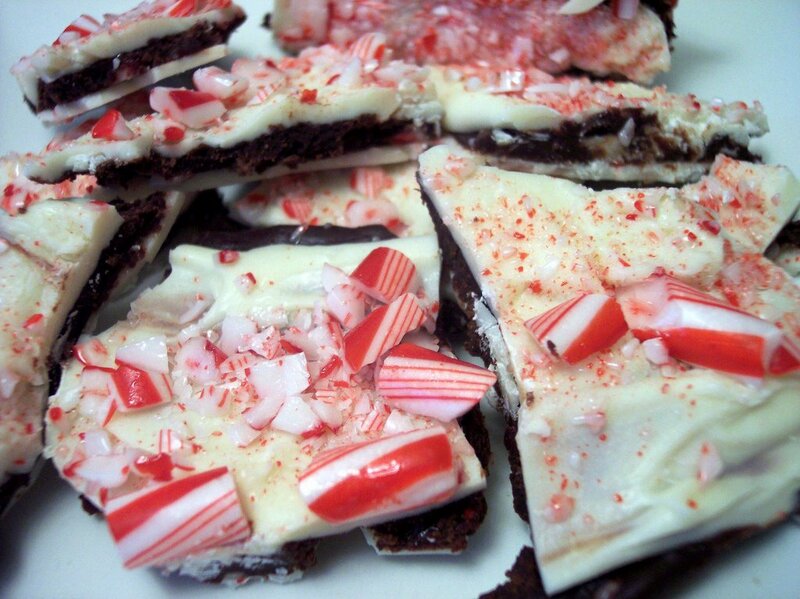 I was flipping through my to-try pile and came across this recipe that I found some time to make them today. We prefer to have a softer crust on our pretzels with a good chew to them. This recipe, Soft Pretzels, lived up to its name. I did make some small changes to the recipe though. To help the dough rise in our cold kitchen today, I turned the light on in the oven before I started preparing the dough. By the time it was ready - the light had heated the inside up to 82 degrees! After the dough had risen enough (gently poke 2 fingers into the dough, if the marks stay - it is ready) we cut up the dough and started rollin' and twistin'. They are quickly dunked in simmering water, coated with an egg glaze, then sprinkled with salt. 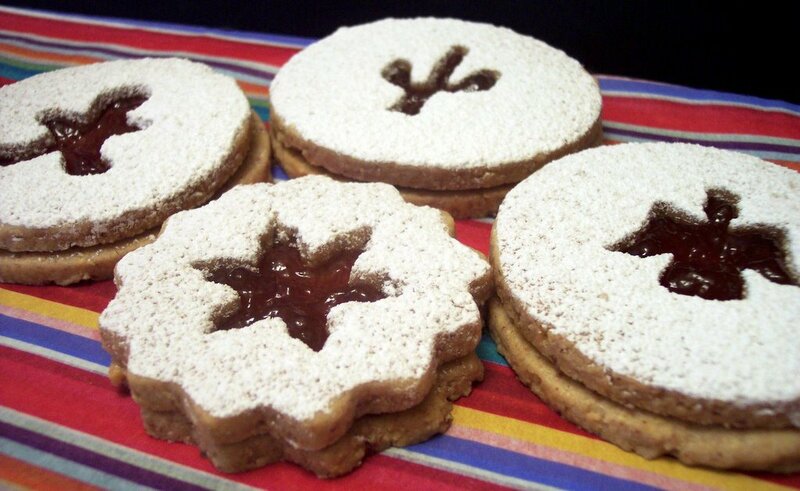 These would also be very good topped with cinnamon sugar, which I will have to do next time. Baked until a deep golden brown, we finished them with a brushing of melted butter and enjoyed a couple fresh out of the oven. 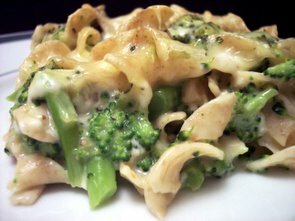 Dinner tonight, Broccoli-Noodle Casserole, used a pasta I had yet to try. I found a whole wheat egg noodle the other day and used it here. This is a white sauce, noodle, broccoli combination that is topped with a couple cheeses. If you go through the ingredient list, this is actually a pretty darn healthy dish. As usual, I used mostly low-fat items (not fat free though, as I find the texture suffers quite a bit.) If you don't have time to blanch some broccoli, you could always use frozen, but I find I like the texture better when I use fresh. Also, if you have a picky eater or do not like the look of cottage cheese, feel free to puree it before adding it to the white sauce. Cayenne added just enough heat to make it interesting and you don't taste the nutmeg, it just adds that little "something". One of the first things I thought of to make when I spotted these Cappuccino Chips was working it into a batch of fudge. The recipe is pretty much the same one that I use for Cinnamon Fudge. 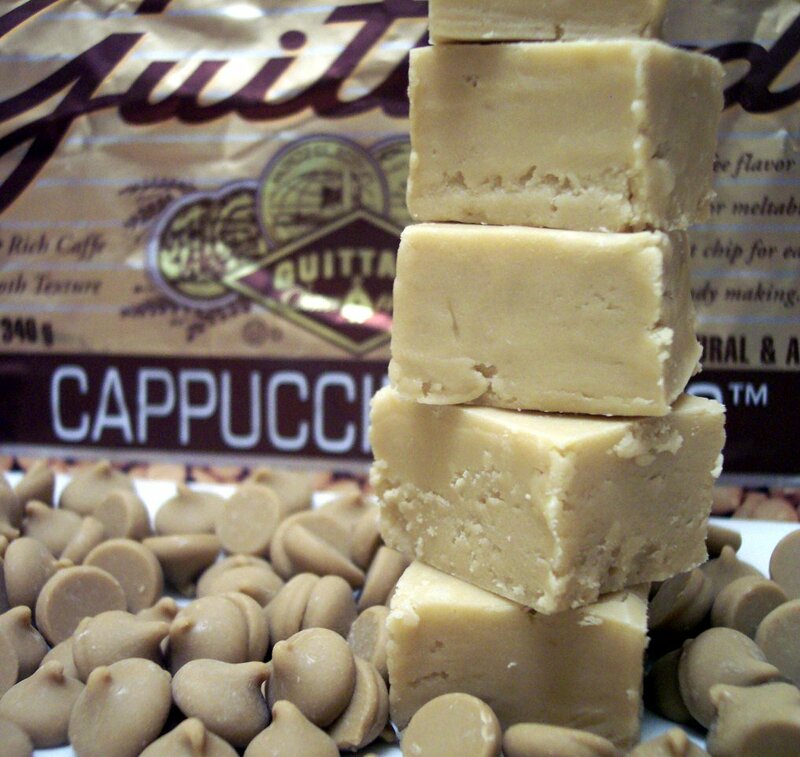 It keeps the same rich and creamy texture as the cinnamon fudge, but it has a very distinct Cappuccino flavor with a coffee aroma. If you can find these and love coffee, this is an execllent way to change up fudge. Next up for these intense chips are some cookies that were suggested I think! We don't often have steaks, but they looked quite good in the store today. I picked them up and came up with a nice change of pace for dinner. Since I had some shrimp in the freezer leftover from another recipe, it was destined to be a Surf-N-Turf night. Rosemary Shrimp Scampi Skewers served with Classic Steak House Rubbed Steaks and baked potatoes hit the spot after dealing with the crowd at the stores today. 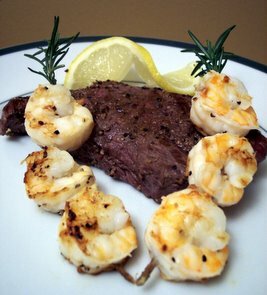 The shrimp soaks in a zesty marinade and is then threaded onto spears of fresh Rosemary. Despite there not being any rosemary beside the spear, the shrimp pick up quite a bit of that woody flavor. After a quick run on the grill, the shrimp curled into succulent tasty bites and we gave them a quick shower of fresh juice from a slice of lemon. The steak was rubbed with a variety of spices and then grilled to a medium-rare. As the title implies, it does remind me of the flavor you would typically get from a steakhouse steak. We hope everyone is enjoying their time with your loved ones today. I woke up bright and early this morning with lots of energy and got started with new recipe for breakfast. Normally I would do something tried and true but this looked so good we had to try it. 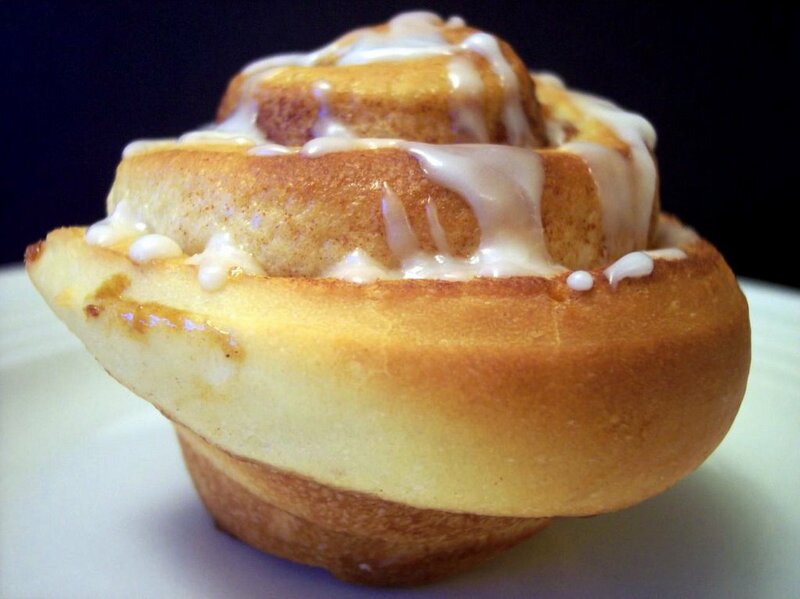 Sour Cream Buns is a twist on cinnamon rolls. 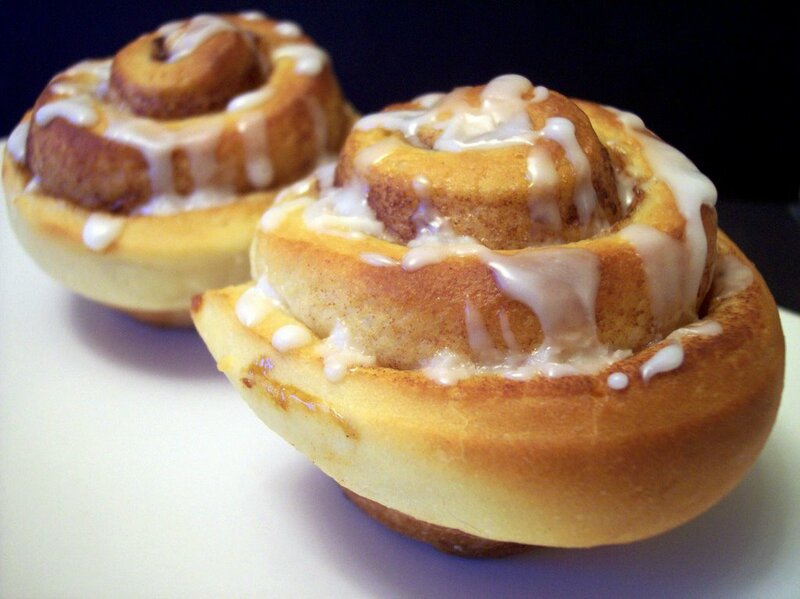 This dough is quite easy to work with and since it only has to do one rise before baking, it allows you to enjoy these sticky, sweet and cinnamon scented treats. They look just like normal rolls as you set them into muffin tins, but you will slowly start to see a change as they rise. When I set the pan and closed the door, I started to watch the timer drop second by second, anxiously awaiting for it to go off. I was enjoying the sweet cinnamon smell waft through the kitchen and finally the timer beeped. I opened the oven and was surprised to see how they expolded into tall swirls of sweet bread. I love to unravel cinnamon rolls and eat from the outside in. These very tender and light rolls fit the bill and have just the right amount of a brown sugar/cinnamon stripe throughout. 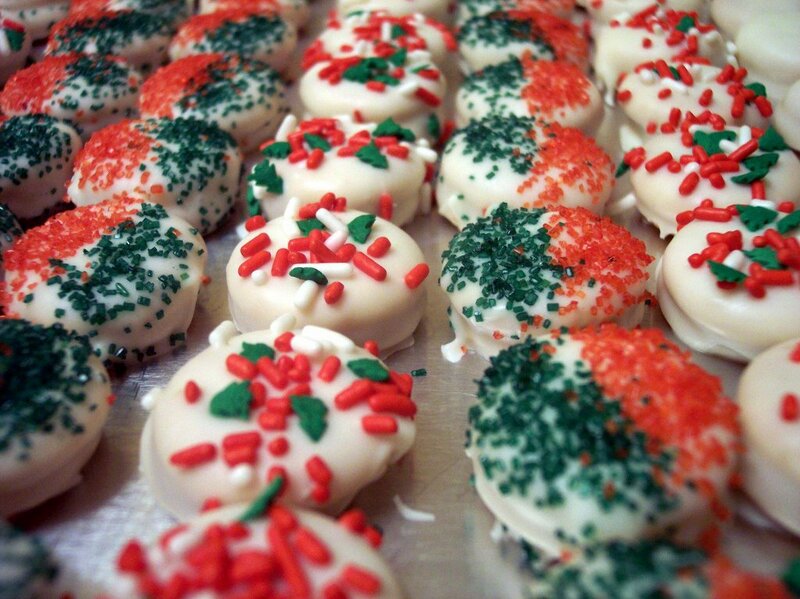 A drizzle of sweet icing caps them with just enough to keep you licking your fingers (or fork) clean. One other thing we do every Christmas Day is to make outrageously large caramel apples. 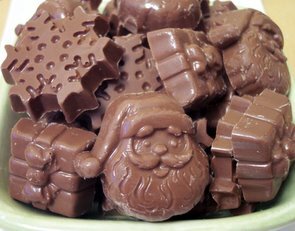 Since we keep on the ligher side of food during the year - this is one day we tend to go a little heavy handed on the treats. One tip - I place the apples in boiling water for just a few seconds to melt any waxy coating is left on and polish them with a dry towel. Sometimes the caramel tends to slide down if we don't do it this way. 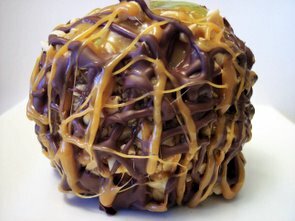 I used the caramel from the Caramel Apple Bar recipe we made earlier in the year. 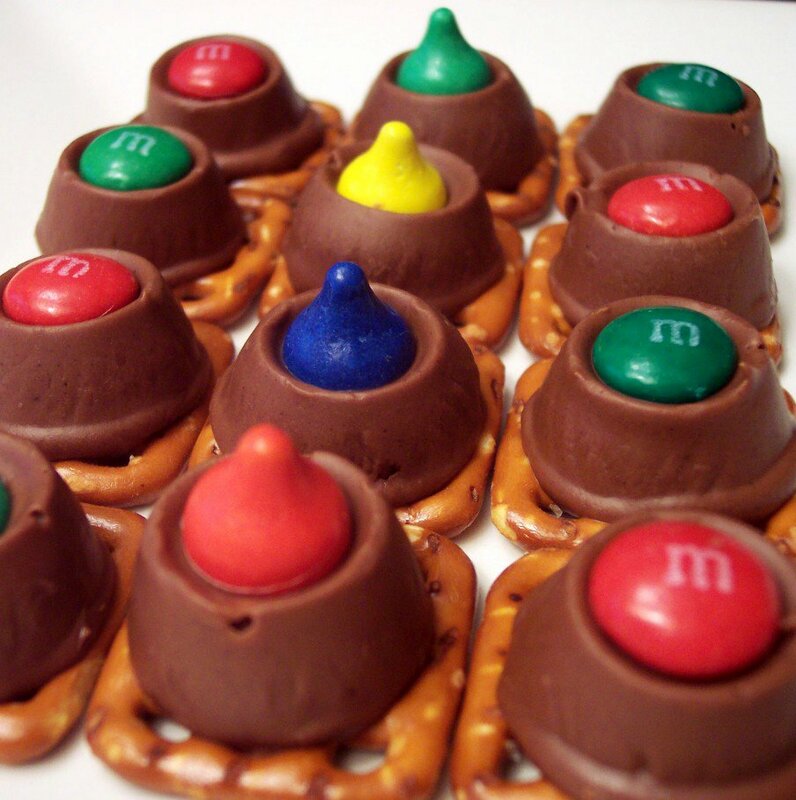 Caramel, M&M, Peanuts and Chocolate coat the apples. 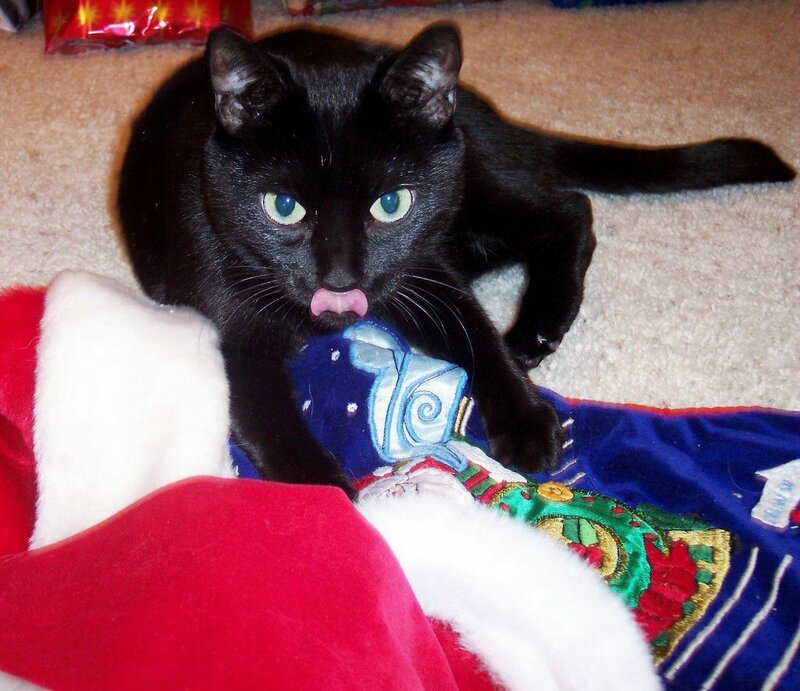 We wanted to take a moment to wish you a Merry Christmas or whichever Holiday you choose to celebrate! 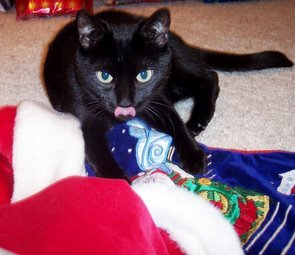 Miss Kitty wanted to send you wishes as well, but she was too busy being sneaky trying to find her presents this morning. She has even learned to stick her tongue out as us! Geez! Miss Kitty was so excited to hear that her buddy for Weekend Cat Blogging 29, Kiri at Eat stuff, finally found his way home after being lost! Welcome Home! We will be hanging around the house tonight snacking and taking it easy. Netflix is bringing some laughs with Beauty Shop starring Queen Latifah. Have a safe and fun evening tonight! If I can wake myself up tomorrow morning, I'll be making a special treat... so if you are around check back tomorrow night and see how it comes out! 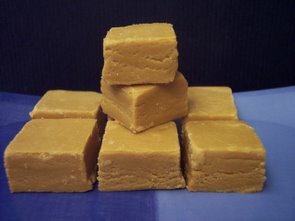 Quick note - I've updated the recipe sections with a new format. You may need to hit refresh to see the changes. Please let me know if any of the links do not work for you. Thanks! In addition to the packages of goodies we sent out in the mail, we also gave packages to our neighboors. When I was making dinner tonight, the doorbell rang and Jeff went to go answer. Boy were we surprised when it was one of our neighboors and they had this huge basket for us! How nice! We didn't expect anything in return - if you read this, thank you so much! 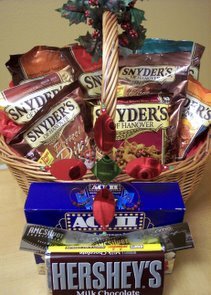 It was filled with chocolate bars, lots of different kinds of pretzels (I wonder if they work for the Synder pretzel company.. hee hee! ), a nice ornament and even a pair of tickets to go to the movies! 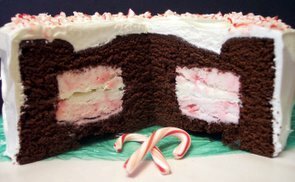 When I saw the picture and recipe for this Peppermint Ice Cream Cake, I immedietly knew I was going to change it a bit because I had special baking pans that were just aching to be used. They have been waiting in the cupboard for far two many years and while I have used them before - it was quite some time ago. They create a tunnel inside the cake where you can stuff whatever you want inside. 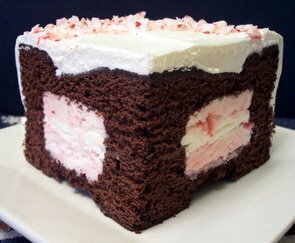 Here is what they look like so you can get an idea of how the cake ended up with a secret tunnel. The cake texture itself reminds me of a cross between a chocolate cake and a brownie. I was happy to see the cake rose pretty high, even with the special indents in the pan. Instead of trying to spread the frozen layers with the softened ice cream, I turned the baking pans over and filled them with ice cream as a template so it would fit perfectly inside the cake. I also used lightly sweetened fresh whipped cream to cover the cake instead of the premade stuff that was suggested. 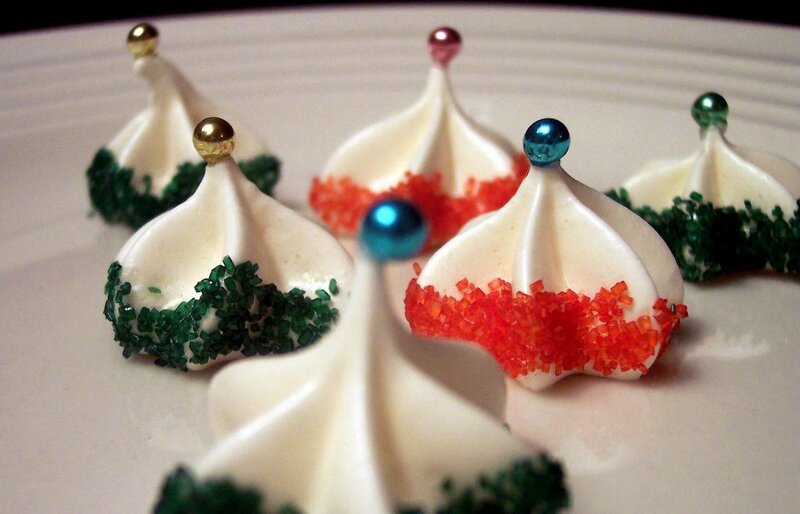 It is the Holidays after all, a little indulgence is good! 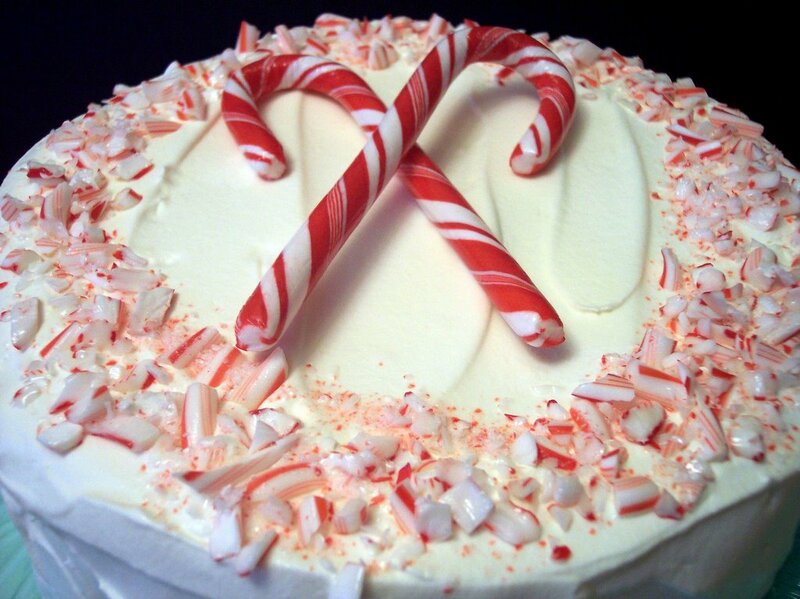 The frosting has a hint of peppermint and the crushed candies give a nice crunch and burst of additional peppermint flavor. Thank god this is frozen because I swear I could eat the whole thing in one sitting... you know... so it would not go bad or anything! Dinner tonight has more of my favorite ingredients. Bacon, potatoes, and cheese - how could this go wrong?! Individual Potato-Bacon Frittatas would be great to make ahead for a quick breakfast on the go. 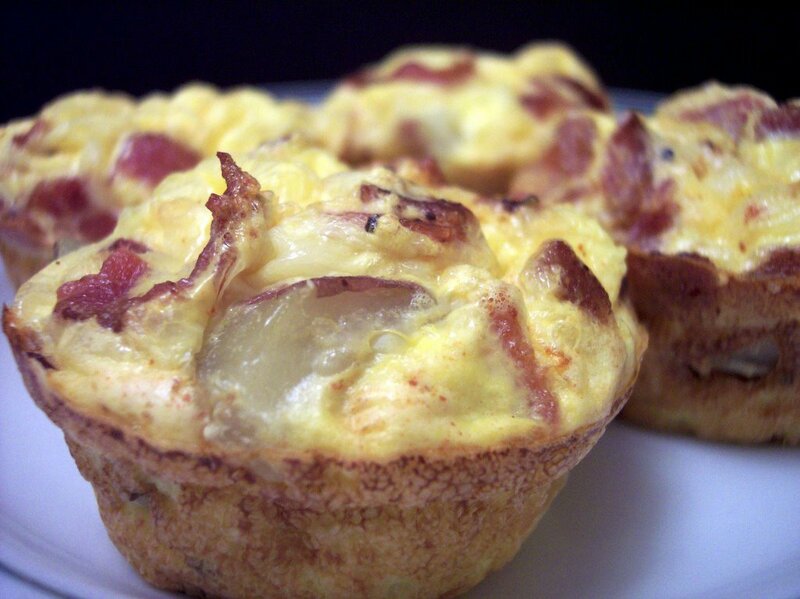 Layered veggies, bacon, and cheese are envolped in seasoned beaten eggs that swell into these tasty little muffins. I wish I would have made a double-batch as I would love to have extra ones in the freezer. I mentioned before when we made the Apple Cinnamon Chip Granola Squares that I thought it would be good with different mix-ins. They were on my mind today so I thought I would try them again. I replaced a couple of the spices, the dried apple/cinnamon chips, and added dried pineapple/flaked coconut. 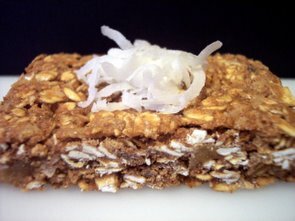 Pineapple-Coconut Granola Squares is something I was not sure would taste all that good in a granola bar, but we were quite suprised as we took our first bite. The two flavors, although subtle, lend a sweetness and chewy texture without overpowering each other. The bars are quite hearty, thick and are a filling snack. I served Chicken Cordon Bleu with simple seasoned steamed carrots and the Asiago-Black Pepper Drop Biscuits from yesterday as dinner tonight. I pounded and rolled the chicken early this morning and let sit in the refrigerator as I find they hold together much better this way. I dipped/breaded right before placing in the oven. The chicken is stuffed with Prosciutto and Cheese, rolled up, dunked in a garlic/butter sauce, then dredged in seasoned breadcrumbs. 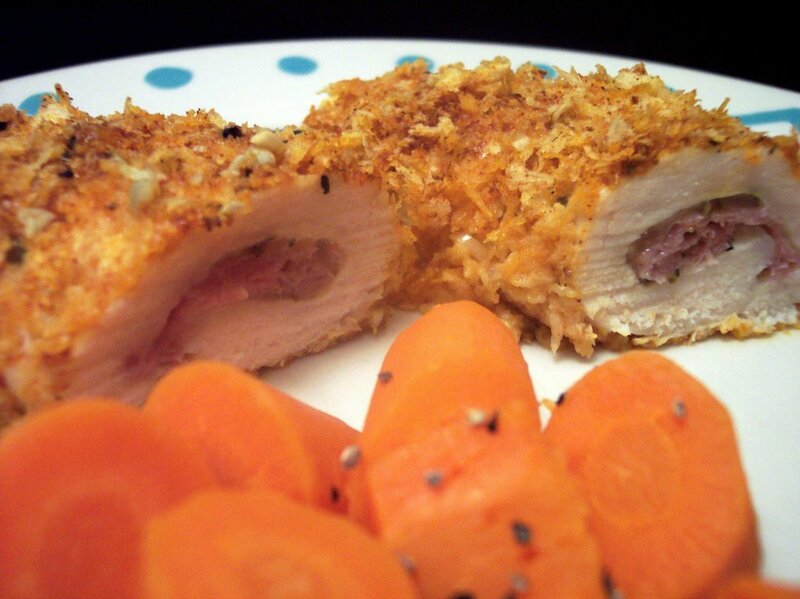 Instead of using regular breadcrumbs, I like to use Panko breadcrumbs in dishes like this. 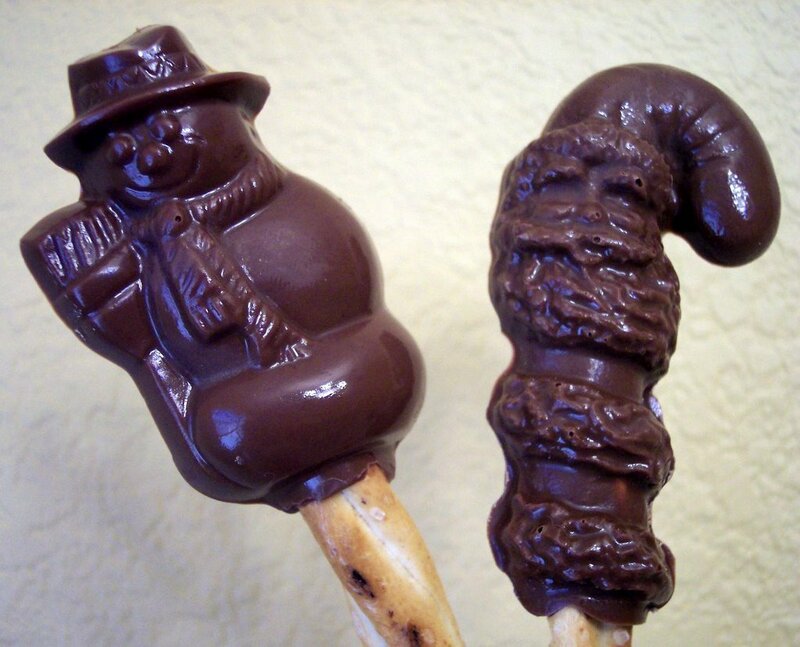 I recently found that Trader Joe's started carrying them and I could not wait to try them out since I ran out of my other stash. Panko, also known as Japanese breadcrumbs, is more coarse and produces a crunchier texture I think for baked meats. I think we've found a new biscuit recipe that ranks right up with our favorite Sour Cream and Cheddar Drop Biscuits. Asiago-Black Pepper Drop Biscuits carry a bite from the black pepper and a pleasant sharp flavor from the Asiago. 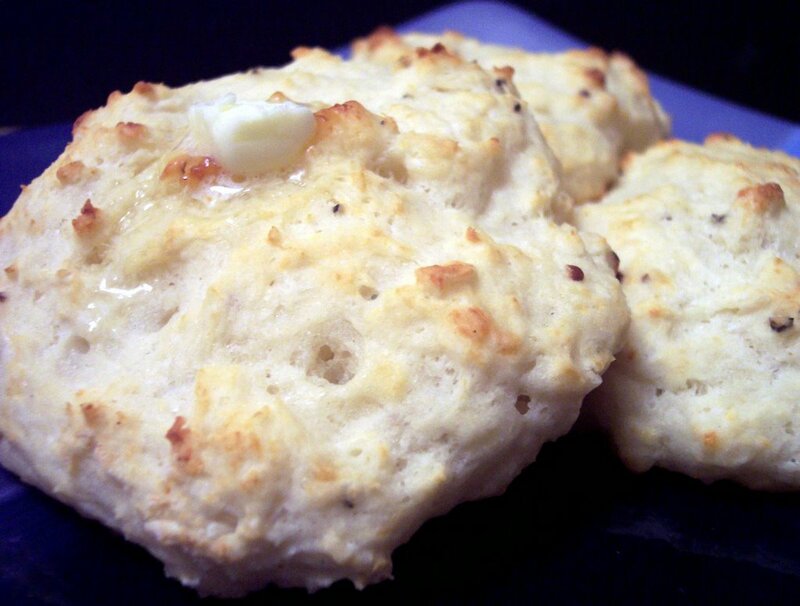 Using buttermilk helps keep these biscuits tender and since there is no rolling involved it comes together in a snap. 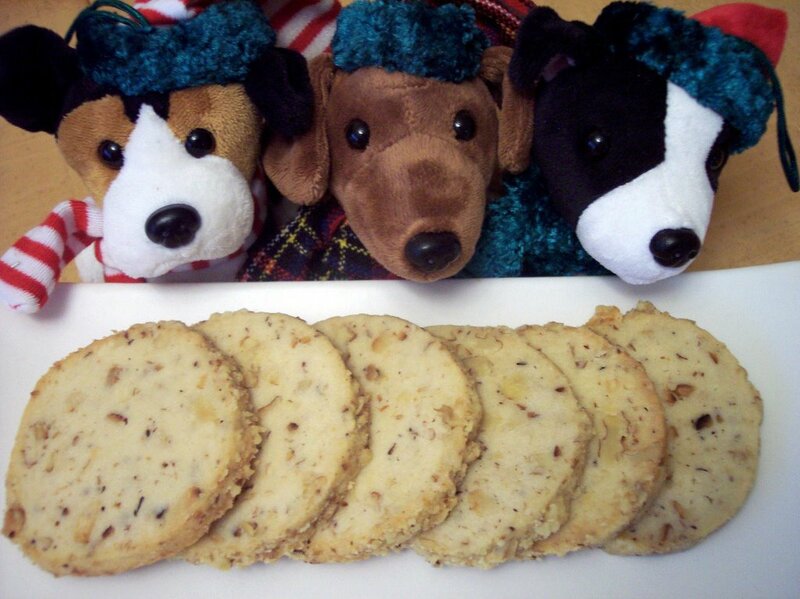 If you would like a more shapely biscuit, you could always bake them in muffin tins. To go along with these, we had Chipotle Meat Loaf that is made with Turkey. 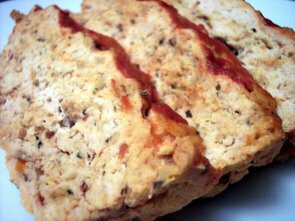 Using ground turkey breast and lean ground turkey help to keep this extremely moist and tender, but without the greasiness that can sometimes occur when using ground beef. I ended up using about 2 1/2 chipotle chiles in adobo because if it is going to be spicy, we like it really hot. Cumin lends a slight smokey flavor and the addition of oats and breadcrumbs helps hold the loaf's shape. To give this a bit more spice, I added a chopped chipotle pepper into the tomato mixture that is spread on top halfway through baking. Meatloaf sandwiches for lunch tomorrow, anyone? Ah.. the calm after the storm of baking. Now the wait begins to hear how the goodies arrived. We're hoping for the best! I believe all of the recipes should be posted in the round up, there are a couple that do not really have recipes - but if you need any instructions on them feel free to e-mail me. I was looking for a satisfying and comforting meal for dinner tonight. 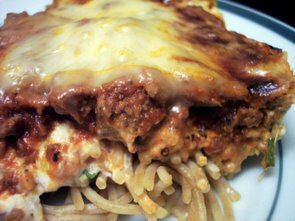 Spaghetti Pie looked like it would fit the bill. Cooked whole wheat spaghetti lays out a solid platform for a mixture of sour cream, cream cheese and green onions. Next, we browned lean ground sirlion and allowed it to gently simmer in some spiced tomato sauce. The beef is then layered on top of the sour cream. A mixture of sharp white cheddar and parmesan is scattered across on top and then baked until brown and bubbly. If allowed to sit and cool for a few minutes, this cuts fairly clean and the layers are exposed. Tender noodles, a creamy and tangy center topped with the spicy and cheesy beef mixture warmed and filled this tummy. Looking forward for lunch tomorrow with the leftovers! We got all of the packages mailed off this morning and now it is time to relax! We avoided the mess at the main Post Office and went to a Hallmark Store a couple miles away that has a Post Office inside. It was completely empty! Have to remember that next year! 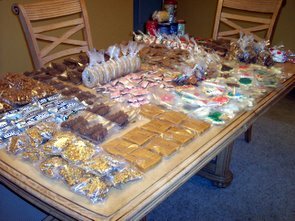 Here's some of the goodies just before we started packing the boxes. 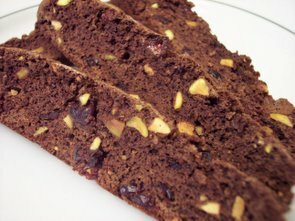 As far as the recipes are concered, I have posted quite a few and have linked them in the goodies name in yesterday's post until I can get them into the main recipe page. You may have to hit refresh to see the changes. Keep checking back if you don't see the title linked - I should have all recipes up by Wednesday. 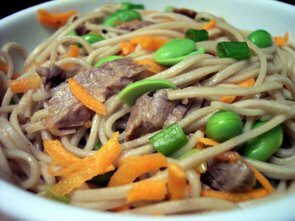 Tonight's dinner, Soba-Edamame Salad with Flank Steak, was a healthy and quick meal. I love the nutty flavor and texture of Soba Noodles, but if you have none on hand you could always use Spaghetti. This uses leftover flank steak from a recipe we made last week which allows this to be thrown together in a snap. 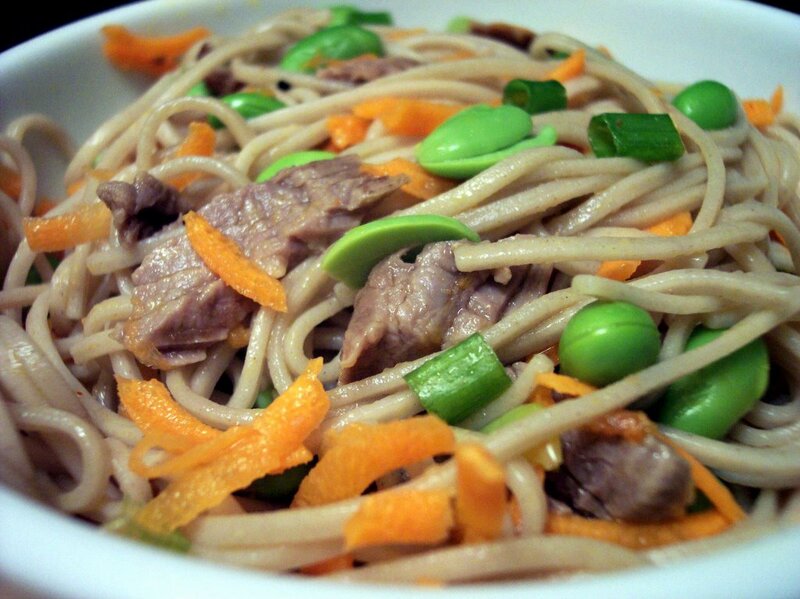 Cooking the noodles and edamame together makes for less dishes too. The soba drinks up the ginger and chili garlic sauce in the dressing which gives it heat and subtle bite. To ease the prepartion of ginger root, I keep mine in the freezer and use a microplane to grate it. 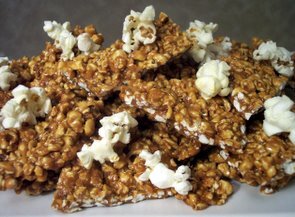 Real White Chocolate Covered Peanut Butter Ritz Bits - This is something we have made for the past 6 years and is always a hit. 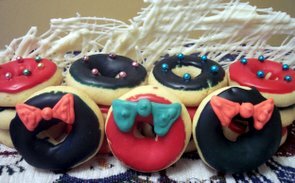 Sugar Cookies - I've used the same recipe for the longest time for these cookies. Easy to roll out and always keep their shape. 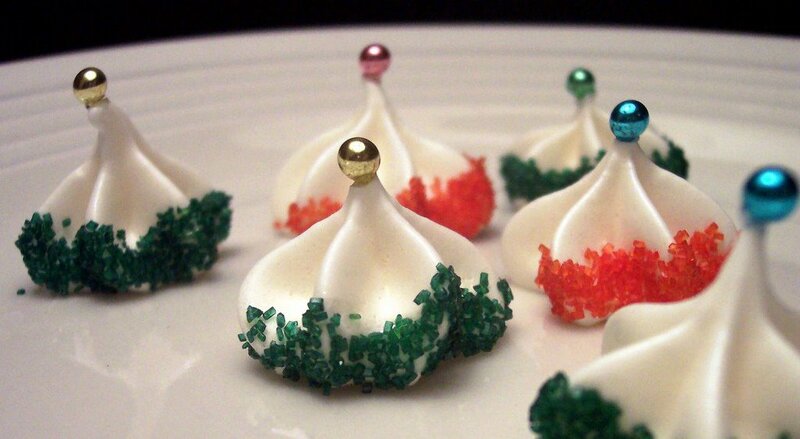 A hint of almond extact pushes the flavor up just enough to make people always ask for the recipe. I used a new Royal Icing recipe that will be the one I use from now on. The frosting sets up enough to stack, but is not rock hard and does not seem to chip when you bite into them. 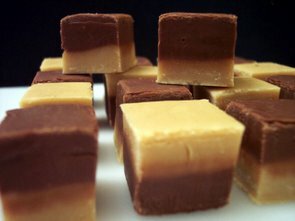 Two Toned Chocolate Peanut Butter Fudge - Peanut Butter Fudge topped with a layer of Chocolate fudge. Not rock hard - Smooth, creamy and oh so good. So I think I'll go pass out now... So much stuff - but I did enjoy doing all of this which is the plus side! If I can keep my eyes open we will be watching Sahara with Matthew Mcconaughey and Penelope Cruz from Netflix tonight. Tomorrow I'll show you everything just before we started packing them up - it was quite a sight! Okay... so I admit it... we may have gone a little overboard with making stuff to send out. We finished up some decorating and have started the proccess of packaging everything up. 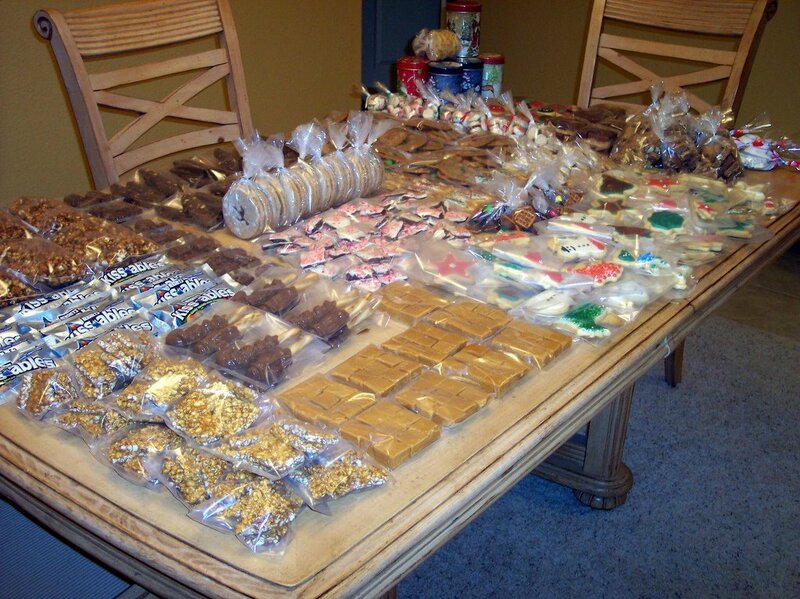 Looking at the piles of goodies is a bit daunting when I think we still have to fit them in boxes to send out! I'll try to get the pictures of everything together in a post for tomorrow or Monday. I will also try to get the recipes posted during this coming week. Here is some dark chocolate that we molded into Santas, snowflakes, and presents. Apparently I didn't get enough of the air bubbles out but I don't have enough time to re-do them! Next is an attempt to make a wreath looking cookie from the doughnut cookies I made a couple months ago. I should have done a little better but I was pretty tired at this point hehe! 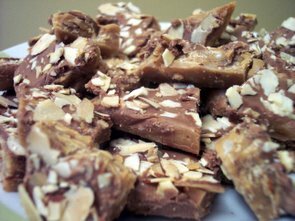 This is one of our favorites - Almond Roca. Crunchy toffee candy topped with chocolate and toasted shaved almonds. If we get a chance to sit down at watch a movie, tonight's DVD from Netflix will be Herbie: Fully Loaded with Lindsay Lohan. I hope to also get a chance to look through some new cooking magazines for dinner ideas for this week - but I may just go through the pile of "to trys" that needs some attention! Stay tuned for the gift baking round up! So what did I do all day today? This is a small preview of a couple items that made it into the gifts we are sending out. 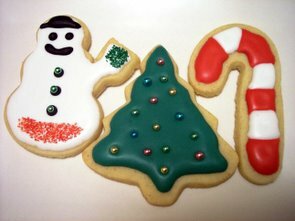 We decorated cookies... so many, many cookies... mostly the sugar variety today. I did make a couple more batches of fudge, another candy, and some peppermint kisses also. Look for the full wrap up later in the weekend for everything we made to send out for gifts this year. Here are a couple pictures of the kisses. * Please Note the correct oven temperature was added in the recipe. Thankfully, dinner was a breeze tonight. Roasted Potato Soup With Sour Cream and Bacon was quite an interesting way to make soup. After roasting the sliced potatoes in the oven, the baking pan is deglazed with boiling water and then poured over the potatoes. You add 5 more cups of boiling liquid, I used half chicken stock and half water, then you let the potatoes marinate for 1 hour. When the time is up, you simple use an immersion blender to cream the soup. 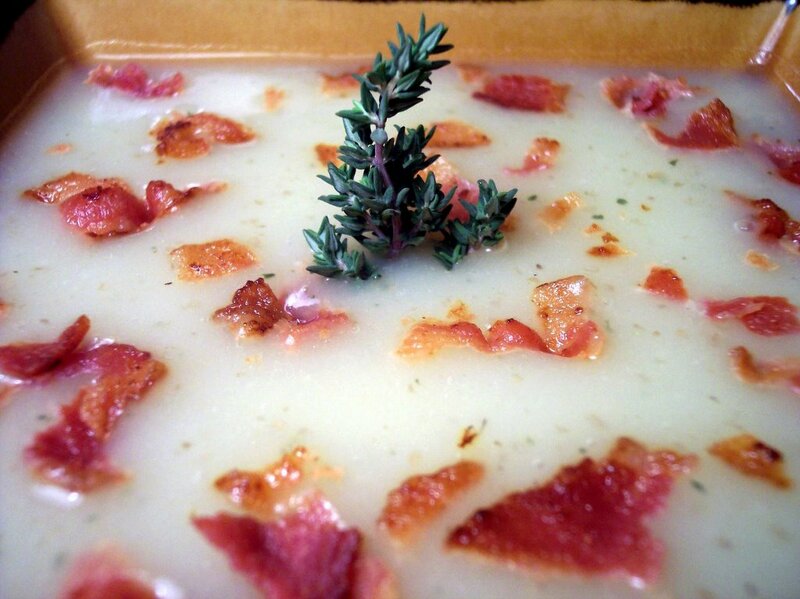 Adding sour cream, crumbled bacon, and fresh thyme takes this comforting soup over the top with flavor. This was such an easy soup for how much flavor it had. I will be making this one again. Put a dent into the butter! Would you like some cookies with your butter?